Allied Toyota Lift offers a full range of top quality forklifts, scissor lifts, boom lifts, sweepers, scrubbers, tuggers, and specialty equipment items to help you get your job done. Our expert staff is prepared to help you determine the right equipment for your application. No matter whether you need forklifts or other Material Handling equipment, we've got you covered. Get it Quick! Often delivery within 24 Hours. There are times when renting a forklift or scissor lift is a better decision than buying or leasing equipment. And when that happens Allied Toyota Lift's forklift rental department is there for your material handling and material movement needs. With a fleet of over 250 forklifts, scissor lifts, sweepers, scrubbers, and specialty equipment items we can help you get your job done. And we can provide training services for usage of unfamiliar equipment rentals to make sure you and your employees operate rented equipment safely and productively. Not Sure What Piece of Equipment is Right for You? 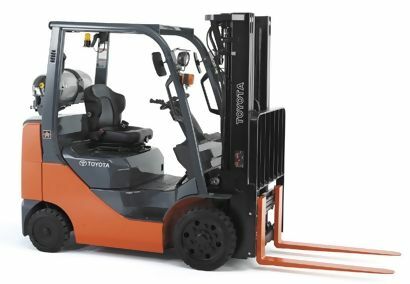 Use Toyota's Online Tool for Selecting the Forklift You Need!